Today I am teaming up with 50 bloggers to bring you Booking Across the USA. There are bloggers sharing books that feature each of the 50 states of the United States. You can find the entire list at Growing Book by Book or at the end of this post. Ready-Set-Read is participating by sharing a book featuring my home state of Missouri! I love reading about Missouri History. I also used to be responsible for teaching Missouri History when I taught fourth grade. Missouri was such an important part of westward expansion. Missouri was also involved in the history of communication. As our country pushed westward, establishing communication routes westward was important. Missouri was briefly a part of this journey as St. Joseph, MO was the starting point of the Pony Express. Off Like the Wind The First Ride of the Pony Express by Michael P. Spradlin is a beautiful picture book that follows the journey of the first pony express rider. The book is presented as a journal that carries readers through eleven days on the Pony express. The book gives real riders' names when known and provides examples of the types of difficulties riders might have faced. The book is excellent for readers to analyze text and infer information while learning the facts of Missouri history. The forward of the book includes a quote from Mark Twain, Missouri author, this is a nice tie-in with Missouri history. It also leads to a good learning activity to use with students after reading the book. I've included this project in a FREE download that includes a teacher's guide, graphic organizers, writing sample, and scoring guide. "The pony-rider was usually a little bit of a man, brim full of spirit and endurance. No matter what time of the day or night his watch came on, and no matter whether it was winter or summer, raining, snowing, hailing, or sleeting... he must also be ready to leap into the saddle and be off like the wind!" 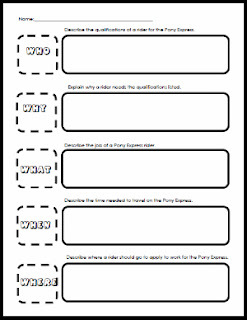 Students can learn a lot about how communication needs change through time by studying the Pony Express. Begin by having your students consider some essential questions. 1. Why does communication change through time? 2. How do difficulties contribute to the need for communication to change? 3. How does the need for communication between people lead to improvements in other areas of life? 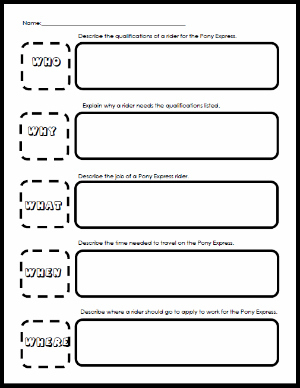 During this activity students will examine the need for the Pony Express. 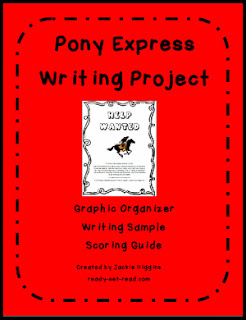 They will analyze the difficulties faced by the Pony Express riders and how those difficulties eventually lead to a different form of communication. They will explain the benefits that were gained in other areas of life as Pony Express riders traveled West and learned about the regions and dangers of the American West. Students can use the book Off Like the Wind by Michael P. Spradlin as well as the resource links at the back of the book to research for the "Help Wanted" project. Students will be given a 5 W's graphic organizer to record their data. They will use this information they collect to create a "Help Wanted" poster. 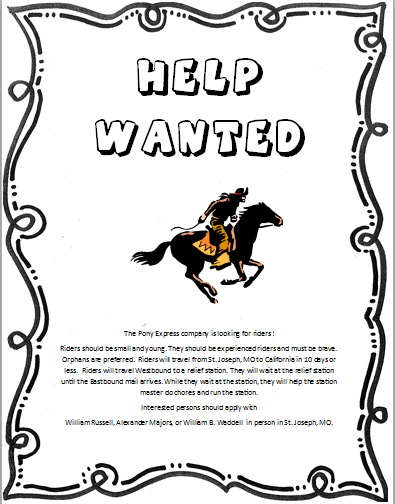 Students will follow a scoring as they create a poster to advertise for riders on the Pony Express. At the end of the activity, teachers could take some time to apply the essential questions from the unit to current issues in communication. How has communication changed since the internet? How do the difficulties of the US Post Office contribute to a need for change in communication? How have changes in communication benefited us in other areas? When children can see a connection between the events of history and the events in their world, their learning grows. Also, children begin to think about our current problems and think of ways to solve them. This eventually leads to productive citizens who will have future solutions! 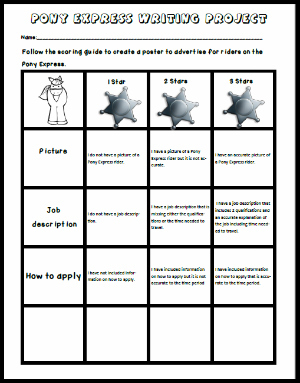 You can download this freebie from my Teacher's Pay Teachers Store. I'd love if you'd rate my product and follow my store for future freebies. Or you can get it free from Google Drive. The details of this book and project are best suited for 3-5 grade students. However, children of many ages will love to look at the pictures and hear true stories of bravery in the Wild West. 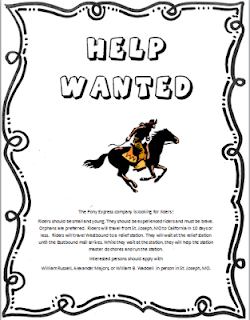 Children might want to dress like a pony express rider or see how far or fast they can gallop! S is for Show Me- An alphabet book exploring Missouri History from the first Native Americans through present day. This book even covers a fun part of my neighborhood, the bone beds at Mastadon State Historic Site. A Picture Book of Lewis and Clark by David Adler This book will actually span more states than just Missouri but the Lewis and Clark expedition is an important part of Missouri History. Little Farm in the Ozarks by Roger Lea McBride These stories continue Laura Ingalls Wilder's books as Rose Wilder (Laura Ingalls Wilders daughter) story is told by her grandson. These books detail life in Southern Missouri in The Wilder home in Mansfield, MO is a popular destination for Missouri tourists. The Adventures of Huckleberry Finn by Mark Twain. Mark Twain not only lived in Missouri, he based his stories on life in Missouri. The classic tale of The Adventures of Huckleberry Finn can be enjoyed by younger readers in The Great Illustrated Classics The Adventures of Huckleberry Finn. Even if you can't take a trip to the historical sites of Missouri, you can visit them in books. In fact, you can visit each of the 50 states through our Book Across the USA project hosted by Growing Book by Book. Check out these amazing projects. Also, stop by Growing Book by Book for a giveaway to go with the project. There are two giveaways. One begins on 2/25/13 and one begins on 2/26/13! All 50 States for Booking Across the USA Blog Hop, A book review and crafts, activities, or freebies are included in each post. All the posts were live on February 25, 2013. Thank you for the variety of resources across the ages. Glad to see any state ABC book included. Thinking of doing a month of state ABC books to follow this and take advantage of the great resources everyone is posting about. I really love your book and project to learn about Missouri!! You created such a great unit! The books look wonderful. I love anything related to Little House! I lived most of my life in Missouri so I'm pretty partial to your post :-) Thank you so much for participating in the Booking Across the USA project! Wonderful, again! Thank you so much. Pinned and downloaded! Great blog post and a fantastic event...I'm so happy I clicked on your link! What a great list of books. Thanks for sharing at The Children's Bookshelf.